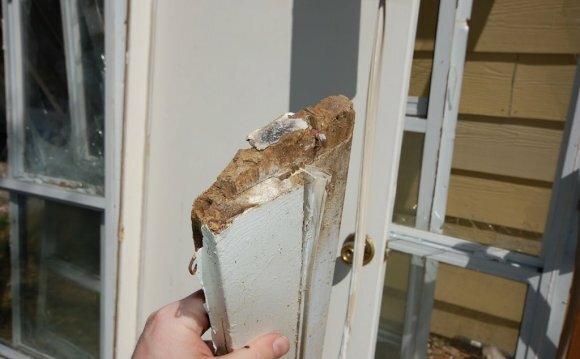 Over time rainwater can damage and rot the door jamb and brick mold on an exterior door. here’s how to go about repairing it. Use a sharp utility knife to cut through the caulking holding the brick mold. Pry off the damaged brick mold using a flat pry bar. Miter a piece of solid vinyl door casing, and cut it to length. Predrill the holes in the vinyl brick mold, and nail it in place. Apply a bead of caulking between the casing and brick and casing and door jamb. Remove any water damaged wood from the door jamb. Insert a piece of folded wire mesh (hardware cloth) in the opening, and secure it in place with screws. Mix up two-part wood filler or auto body filler. Use a putty knife to fill the cavity with filler. Allow the filler to set for a few minutes, then remove any excess with a sharp chisel before it gets too hard. Apply additional filler, if needed, to fill any gaps. Stand the hardened filler smooth with the surrounding door jamb. Allow the filler to dry overnight. Apply a coat of exterior primer, followed by two coats of exterior paint. Danny Lipford: Rain and snow can harm your home in a number of ways, especially if you have an overhang—like this—that allows water to drip down and splash back against the doorway. Now it’ll cause mold and mildew, like you see here, but even worse, water seeps under the door frame and can damage areas just like we had here. Now, we’ve already repaired it, not by replacing all of the damaged pieces, but replacing some and repairing the others with special exterior wood putty. The first thing we did is to remove the brick mold. I start removing the brick mold by first cutting the caulking with a razor knife, then prying it off the frame with a flat bar. Now for its replacement, I used a vinyl brick mold that’s resistant to any type of water damage. I predrilled all of the holes for the nails, then used a galvanized finish nail to secure the new molding to the frame. Then I cleaned out all of the damaged area and installed a piece of folded wire mesh using several long screws. Now, it was time for the special wood putty I’d mentioned. Now this is a two-part system that requires thorough mixing of the putty and the cream hardener that comes with this particular type of putty. Now I used a putty knife to apply the mixture and worked it until it was nice and smooth. A little sanding and it was ready to paint.